A panel interview is a job interview in which an applicant answers questions from a group of people who then make the hiring decision. Hiring managers use panel interviews to gain perspective from other people in the organization and occasionally those outside the organization. Panel interviews reduce the risk of making a bad hire. The panel’s goal is to make the best hiring decision possible given the information available about the position and the finalists. Since each panel member brings a different set of experiences, thoughts, beliefs, and biases to the interview process, the members' strengths tend to compensate for each others' weaknesses. In the most effective panels, members work well with one another while being unafraid to respectfully challenge each other’s judgments and assertions about the potential hire. Members of the interview panel are often people who will routinely interact with the person chosen to fill the job vacancy and who know the organization and its culture well. For example, an interview panel for an assistant police chief position may consist of the police chief, the fire chief, and an assistant city manager. The panel can also include peers and even those whom the potential hire will manage. These people have a vested interest in making a good hire. In the long run, a bad hire will mean unnecessary disruption for the people who work closely with the new person on the staff. Organizations often factor in two types of diversity when deciding who will serve on interview panels. By ensuring a panel includes men and women and a mix of races, organizations mitigate the risk of applicants suing on the basis of discrimination. Just defending against a lawsuit costs an organization considerable time and money, so any cost-free action the organization can take to prevent such a lawsuit makes sense. The hiring manager generally leads the panel and asks the predetermined interview questions. Alternatively, a member of human resources or a recruiter can help facilitate the interview. All panelists are free to ask follow-up or probing questions. The predetermined questions are the same for each finalist. The follow-up and probing questions are different for each finalist because they are based on how the finalist answers the predetermined questions. The panel lead is responsible for controlling the start and finish of the interview. Hiring managers tend to schedule panel interviews all in one day. It is easier to block out an entire workday than to find five 90-minute blocks of time within a few days that fit each panelist’s schedule. Scheduling for one day also makes the interview process shorter. 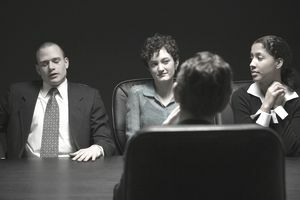 The panelists can come to a decision the same day that finalists are interviewed. Since vacancies cause stress and strain among existing staff because remaining employees must cover the vacant position’s workload, anything that shortens the hiring process without sacrificing thoroughness is good for the finalists as well as the organization.